The Healthy Driven Naperville Marathon & Half Marathon, sponsored by Edward-Elmhurst Health, draws participants from across the globe to Naperville's lively downtown, historic sights and beautiful neighborhoods. The event has established itself as one of the premier endurance events in the Midwest and Naperville as a destination for running enthusiasts. J Rudny was contracted by Naperville Marathon to create a fresh new website that is fully responsive and user-friendly to properly represent their marathon, half-marathon and kids marathon. The Naperville Marathon project consisted of several major factors that needed to be resolved in order to make their support staff self-sufficient, as well as provide a timely launch for race registration. Fresh creative for a fully-responsive design layout. Integrate and utilize WordPress as the staff Content Management System. User-Friendly navigation to easily represent and find the three major races. Integrate social sharing, race countdown clock, parallax layout areas, and photography slider features. Establish a main website address and properly redirect past addresses for a consistent branding effort. 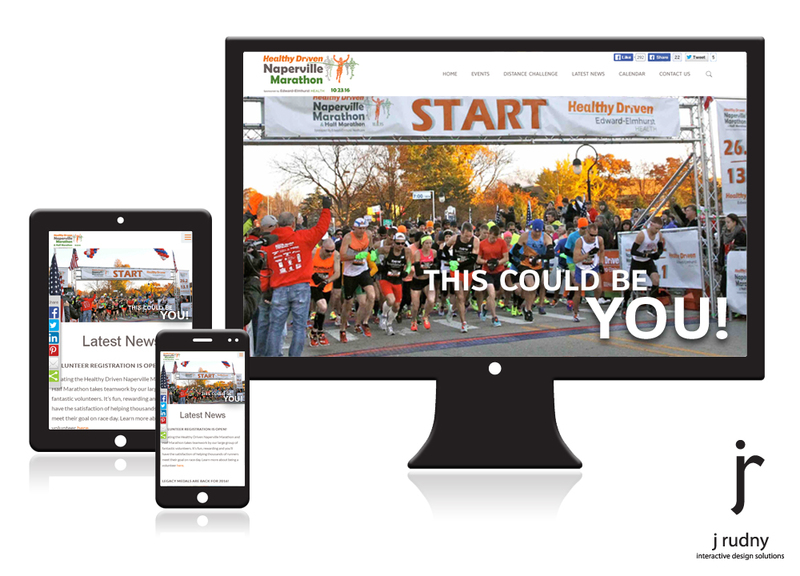 Our solution was to provide the Naperville Marathon with a fresh and fully-responsive design for desktop, tablet and mobile devices. In addition, a fully functional content management system was installed to allow staff the ability to manage content as needed. Finally, we recommended merging two separate websites that were promoting the race, into one site and address for consistent marketing efforts. Fully-responsive layout for desktop, tablet and mobile devices. Customization of the WordPress Content Management System. Additional features installed and integrated for WordPress Content Management System. Established main website address of runnaperville.com and redirected past domains for consistent branding. Removal of past websites to eliminate user confusion. Implement proper organic search engine optimization tasks and verification. Implement Google Analytics tracking to establish event analytics. Provided complete training for staff on content management.